She is clothed with strength and dignity and she laughs without fear of the future. 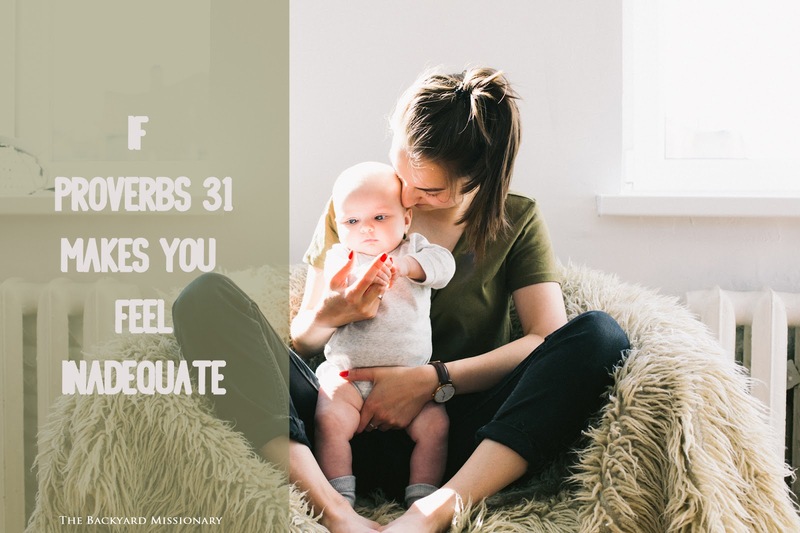 To those of us in the trenches of motherhood Proverbs 31 seems like a long, ugly list just waiting to point out our shortcomings. Nothing can make you feel inadequate quite like this chapter when you are a weary, worn-thin mother. Your sink is full of dirty dishes, your inbox is overflowing, there is a load of laundry in your machine that you washed three days ago and you’ve successfully forgotten to take it out (though you’ve probably remembered to start the wash for good measure at least twice by now). And one day, one extra chaotic day, you snap. (Probably shortly after you’ve come home from church on a Sunday after sitting in the nursery with your tiny child again, still not having heard a single sentence from the sermon for what will have seemed like eternity). You’ll long for those days when you would sit quietly meditating on God’s word. Those days when you would pray in the quiet of your home. Those days when you dreamed of working overseas to serve in an orphanage, or building homes, or supplying people with fresh water-- you know, the important stuff! You’ll come home, quietly stifle your tears while you plop sandwich meat on some bread for lunch, then excuse yourself to collapse on your bed. The thought of further adding Proverbs 31 expectations to your plate to be the “ideal” woman causes you to sink deeper into despair. On some level, you think perhaps you’ve failed miserably in your ability to keep up. I'm fairly certain I just described every mother with children. But, there may be a slightly different picture of who this Proverbs 31 woman is suppose to be. It’s also clear to see who she isn’t. In the 21 verses that describe this woman, nowhere does it say she sits quietly for hours deep in prayer with God, nowhere does it say she leaves behind the mundane and goes to serve in a foreign country. This gives us hope! If you really slow down this chapter you’ll find what most of us would say are the mundane chores of a day. She makes meals for her family, she shops for the best deal on whatever her household needs, she stays up late hemming her husband's pants (well, sort of). Her husband is well known and highly regarded, so we can safely assume she A) spends a lot of time listening to him and being an encourager, and B) she holds down the fort while he tends to work so he doesn’t have to worry about home. She sews clothes, has a little business to earn a little money, and watches over her household and family (probably even wiping snotty noses in there somewhere). And while she opens her arms to the needy, it seems to be right out her back door, not overseas. Every single one of those tasks isn’t glamorous. None of those tasks demand the, “Look at me, I’m serving and doing amazing things for God!” kind of attention. They are the quiet and the ordinary things of life. It’s 21 verses of a busy wife/mom doing what busy wives/moms do best. It’s 21 verses of dishes, laundry, drying teary eyes, mopping floors, showering, date night, hemming pants, and making a casserole for a sick neighbour. Sometimes God moves us quickly from one spot to another, and other times we are called to just sit tight...for what seems like forever (especially when we're in the middle of it). He anchors us for awhile so to speak. He’s doing it because he doesn’t NEED us to do anything, except to be right where we are. He doesn’t need our hands holding orphans in Uganda, he’s got it. What he really needs is us holding the hands of our children. He doesn’t need our mouths teaching English in Singapore, he’s got that too. He’d rather our mouths teach our children. He doesn’t need us to stay up for hours contemplating deep theological theories, he knows them all anyway. Go to bed, tired mama! 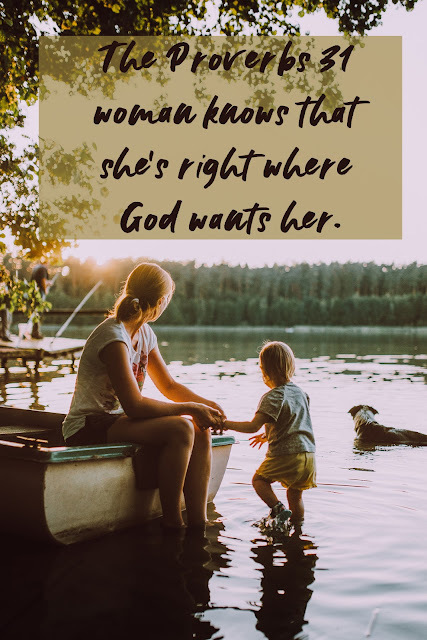 Above all else, the Proverbs 31 woman knows that she’s right where God wants her. She knows she’s serving God through the mundane. It isn’t where she is or what she’s doing, it’s her attitude. She knows that when this world fades away it won’t matter whether she’s washed laundry, cooked hot dogs and Kraft Dinner, and cleaned dog puke stains from the carpet for the entire last year, or created a ministry that clothes the homeless around the globe. What will matter is HOW she served WHEREVER she served. Did she feed her family the KD and hotdogs with kindness, and treat the little one who spilled their cup of water for the gazzilionth time with a gentle approach that reflected God? Did she seek to do the mundane knowing it was God that required that of her, not just temporary circumstances that she's only waiting to get through to get to the other side of where she can REALLY serve? Her strength and dignity, and her fearlessness of tomorrow all come from knowing that she’s right where God needs her. Right here. Right now. He makes the world spin, he really doesn’t need us to do anything more than sit down on the floor and read "Hop on Pop" to our tiny child one more time before bed. Our lives bring him glory whether we heard this week's sermon OR if we rocked our baby in a chair while attempting to stay awake from sleep deprivation in the back corner of church. You’re right where God needs you. At the end of the day, when you crawl into bed and mutter a tiny, “Thank you for getting me through today”, before you fall asleep, it’s enough for this season you’re in. You're doing enough. God needs you here. Right here. And rest assured, one day you'll hear a sermon again.